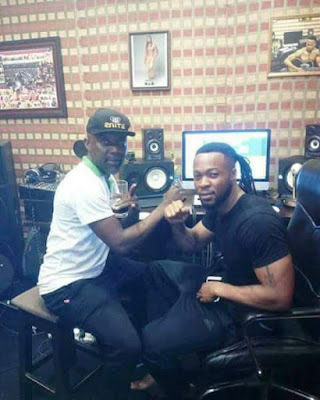 Music is a serious business and one would be wondering why Nigeria’s best musical stars are not ashamed or not afraid to show their affiliation to one fraternity or the other. These musicians are not taking their fans for granted but are only trying to be as real as possible. Enugu state born singer and ‘Golibe’ crooner Flavour is the latest musical artiste to show signs he is a member of the Neo Black Movement of Africa, a pan African organization committed to the ideals of social justice and equality. Music is show biz, meaning it is a serious business but so many fans don’t understand the rudiments of the musical business. You think for top musical artiste like 2baba, Daddy SHowkey, Wizkid, Davido, Flavour, Timaya and even popular Nollywood actors to give speculations of being members of one fraternity or the other is out of line? No you are wrong. These musical artiste involved in the music business have managers, special advisers and those who manage them as brands. For these musical artistes being linked to one frat is a means of getting in the news and that means controversy and controversy on the other hand in the entertainment business means more popularity and more fame. It would surprise you to know some of these musical artistes are not members of any frat but they act like they do… why? Because it is show business! I came to understand that if your business isn’t on the media then it is more or less nonexistent! And this is just how the musical business is. If you are not popular you can’t be made a brand ambassador.. Now tell me, which of these musicians that have been linked to one fraternity or the other isn’t representing one brand or the other? I never thought flavor could come out open to give someone ‘Egede’ (the axemen way of shaking hands) but since I started taking a look at it from the business perspective I came to the conclusion that these guys are just playing mind games and they are in line. Well, the end matters! Yes it does!